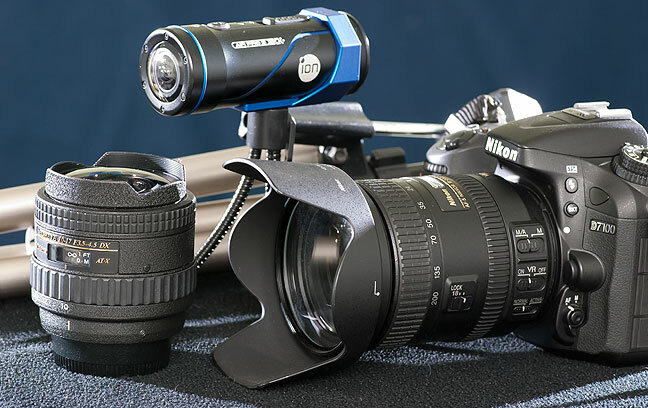 The “dream team” for the road: the Nikon D7100, the Nikkor AF-S 18-200mm, the Tokina 10-17mm, the iON action camera, and the small, lightweight Slik tripod. As I have mentioned in previous posts, when I travel, I like to travel light. I also like to be able to accomplish my photographic goals, which are often quite ambitious. 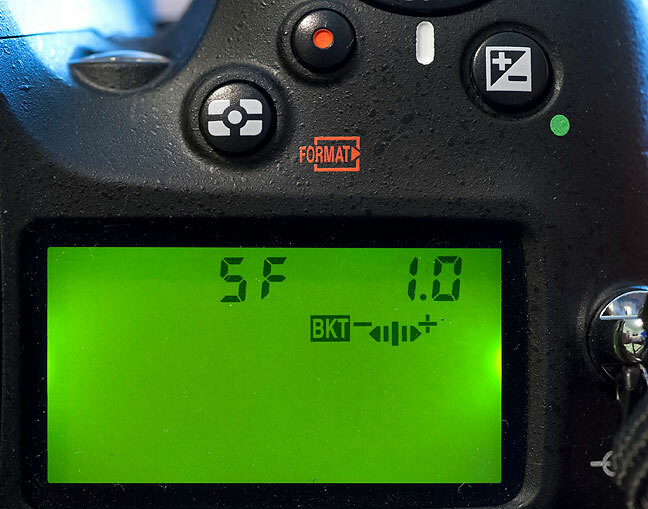 Like many modern Digital SLRs, the Nikon D7100 allows you to automate bracketing. With the self-timer on five seconds and the bracketing set to five frames at one-stop intervals (shown), you can release the shutter and let the camera do the rest. Earlier this year I was able to cash in some credit card rewards points for a Nikon D7100 and a AF-S DX Nikkor 18-200mm f/3.5-5.6G ED VR II. I took it to the desert in March with quite a bit of success, and it was my main camera on our recent anniversary vacation. After these two week-long adventures, a couple of commercial assignments, using it for teaching, and having it as my primary grab-camera, I now believe that the D7100 with the 18-200mm is an outstanding choice for this type of image making. As in the desert in March, on the anniversary vacation I partnered the D7100 and the 18-200mm with my Tokina 10-17mm f/3.5-4.5 AT-X 107 AF DX fisheye. I also added our new iON Air Pro™ 3 Wi-Fi action camera, and my small, lightweight Slik tripod. Together, the package is small, lightweight, versatile and fun. 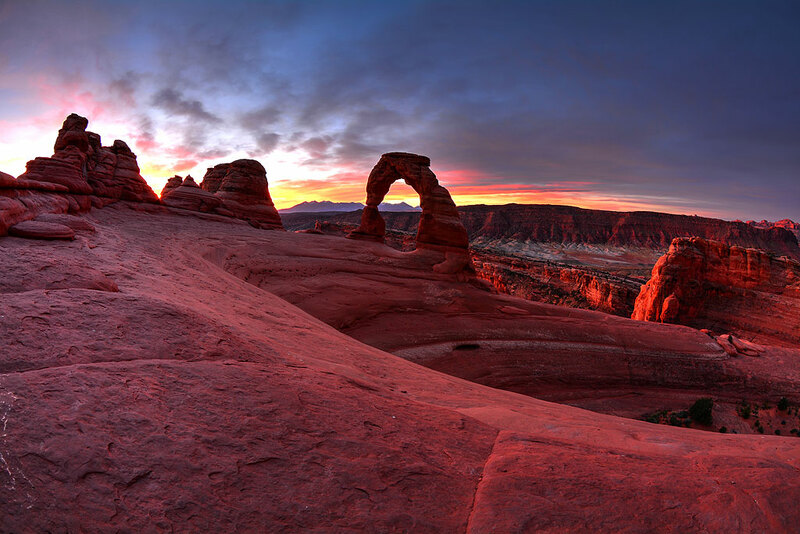 One of my photographic goals on the most recent trip was to photograph Utah’s iconic Delicate Arch in Arches National Park, where Abby and I got married ten years earlier, before and at dawn. Part of this desire was the notion that images of this attraction are becoming stale due to its increase in popularity. 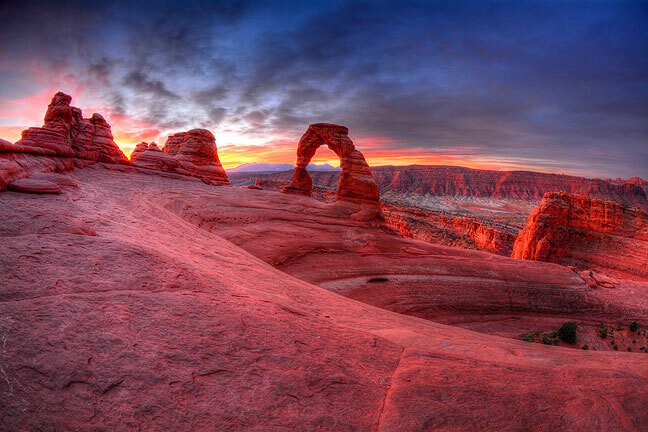 I wanted to make images that stood out from the thousands of images made of Delicate Arch every day. I selected five frames from my sequence, each a different exposure, loaded them into Adobe Bridge, then told Bridge to open them in Photomatix Pro. I was also mindful that a piece of software I use, Photomatix Pro, was recently upgraded to version 5, which included improvements in image rendering, as well as the addition of a number of presets for creation of High Dynamic Range (HDR) images. Putting these pieces together, I concluded that I would aim to make images at multiple exposure settings (called bracketing), and use Photomatix Pro to render them into an HDR image, then put the finishing touches on them in Adobe Photoshop. The result achieved what I wanted, a beautiful and unique rendering of an over-photographed icon that has special meaning to my wife and me. This is the result of combining five exposures using the “enhanced” preset in Photomatix Pro, along with a couple of slight tweaks in Photoshop. The lens for this particular shot was the Tokina 10-17mm. Exposures ranged from one to 16 seconds, all at f/11. I think it is magnificent. One of the key features of HDR is its ability to render the same series of frames of the same scene with a very different look. The frame before this and this image were both made from the same five frames, but rendered with a different “look” in Photomatix Pro.